The Tourism event of the year is fast approaching, which will see hundreds of guests gather for an evening of celebration, fun and entertainment, as well as a chance to meet with their peers from local businesses and rub shoulders with VIPs from the Tourism Industry. On Thursday 9th March the 2017 Bournemouth Tourism black tie gala dinner and awards ceremony will take place at the BIC Bournemouth, and has now developed into a key event in the annual calendar which we all look forward to. The evening will begin with an elegant drinks reception provided by Templar Wines, Pothecary Gin and Mai Tai, complimented with entertainment and networking, guests will enjoy a 3 course dinner with wines, the 2017 finalists and winners will be announced and presented with their well-deserved awards by local TV star and national panto performer Chris Jarvis. Performers will include singer Tara Flanagan, Lee Hayter on the keyboard, and The Guilty Pleasures – back by popular demand from last year! 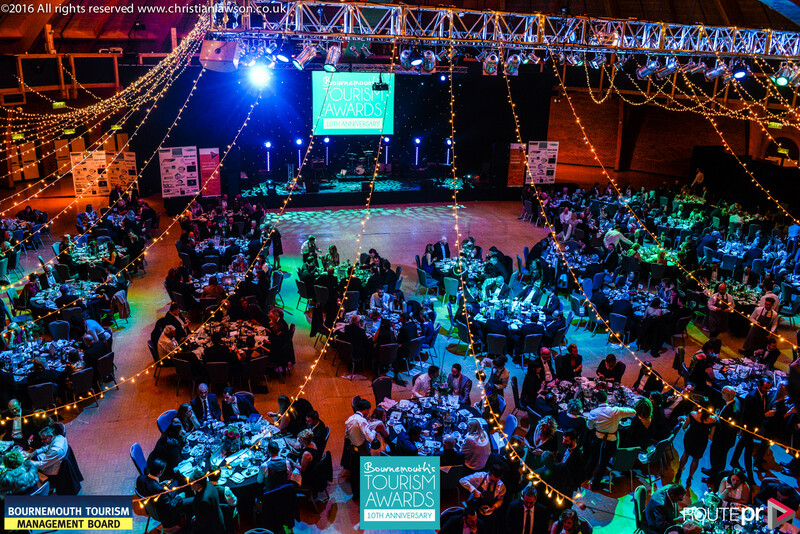 It’s your last chance to grab your tickets which can be purchased at: http://tourism-awards.co.uk/bournemouth/event/2017-bournemouth-tourism-awards-gala-dinner/. Tickets are £65 per person including VAT and tables of 10 are £600 including VAT. There is also a last chance to take advantage of showcasing your business which will be seen by hundreds of professionals in attendance on the evening, for more information contact Jackie@routepr.agency.